Most pagans are familiar with Professor Ronald Hutton’s earlier work about nice modern pagan witches, the kind that celebrate nature rather than going around cursing your crops, cattle and kids. Well, his latest book is about the other kind – the historic view of witches as beings who use magic for harm. As he explains, it is a definition still used in academic circles and in many parts of the world where witches are much-feared today. The Witch: A History of Fear is a wide-ranging study of what people believed about evil magicians and sorcerers from ancient times to the present. Why have societies all across the world feared witchcraft? This book delves deeply into its context, beliefs, and origins in Europe’s history. The witch came to prominence—and often a painful death—in early modern Europe, yet her origins are much more geographically diverse and historically deep. In this landmark book, Ronald Hutton traces witchcraft from the ancient world to the early-modern stake. As Professor Hutton explains, in recent years most studies of the European witchcraft trials have focused on specific regions and looked at local factors that caused accusations and persecution. The Witch takes a much broader approach, but also looks at local variations. I always love reading Ronald Hutton's books - as much as I love hearing him talk. A few months ago I was lucky enough to get a ticket for a lecture he gave on the Wild Hunt and the Witches, which included material from this book. He looked at legends of spectral hunstmen, ghostly armies and groups of women led on nightly processions by powerful supernatural women and concluded that these were often separate traditions that had become mingled by later folklorists into our current concepts of the wild hunt. In his book he looks at many other strands that fed into witchcraft beliefs, including ancient pagan attitudes, shamanic traditions, ceremonial magic, what the Middle Ages made of the witch, witches and fairies, views on Celticity and witches and animals. 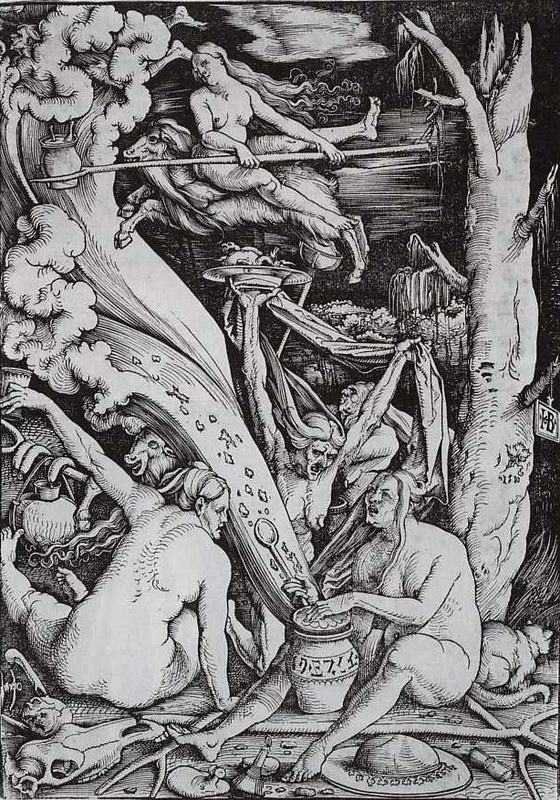 His findings show that by taking in the wider picture we can better understand why witchcraft persecutions soared in early modern Europe, but by also looking at local variations we can find fascinating developments in folk beliefs and in witchcraft. As all of Ronald Hutton's books, this is must-read material for anyone interested in the history of witchcraft. You can view The Witch on Amazon and also view The Triumph of the Moon on Amazon. 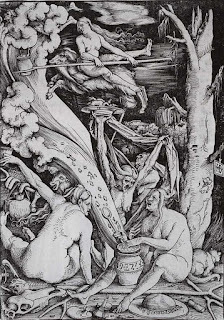 The photo at the top shows a 16th century picture of witches by Hans Baldung Grien, also used as one of the illustrations inside The Witch. I was fortunate enough to attend the Wild Hunt and the Witches lecture at Senate House too. I'm looking forward to the book very much.